After a few more days of wind and rain, many of us Bostonians are looking forward to enjoying a little sunshine over the weekend. If you count yourself among that many, here's one great way to spend a sunny Saturday. From 10:00-2:00, Earthworks will be hosting a volunteer day at their Edward L. Cooper Center Orchard, doing general cleanup, pruning raspberry bushes, preparing the soil, and transplanting some beech plums, just to name a few activities. If you're not familiar with Earthworks, they are a wonderful local non-profit that plants and cares for urban orchards as a means toward environmental education and creating a healthier, more sustainable city. 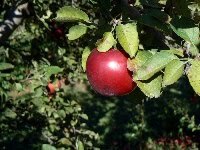 They maintain orchards in urban areas across Boston, many of them in schoolyards, and the fruit is free for the picking throughout the summer and fall--you can find the orchard nearest you on their website. Needless to say, they do some fabulous work in our communities, and supporting the start to the growing season certainly sounds like a great way to spend a few hours on the weekend! If you're interested in joining them on Saturday, the details are below. And if you can't make it this weekend, not to worry--there will be volunteer days on April 24th and May 22nd as well. If you're interested, please call for times and details as the dates get closer. The Edward L. Cooper Center is at 34 Linwood Street in Roxbury. There is plenty of room to park, and it's about a five minute walk from the Roxbury Crossing stop on the Orange line. Earthworks will provide you with all the tools and guidance you need, but long sleeves and pants are recommended as there may be some messy or thorny spots that need attention. Water will also be provided, and you should feel free to bring some snacks as well! If you plan on joining in the fun, please be sure to call the Earthworks office (617.442.1059) to let them know you'll be coming--they need to know how many people to expect. For the new issue of Edible Boston, I wrote an article about Community Servings, a remarkable organization just down the street from me in Jamaica Plain. In addition to providing healthy, nutritionally-balanced meals to the critically ill, they play host to a farmers market, a CSA, and a number of other programs centered in healthy, whole, sustainable food. They are a force for positive change in many underserved neighborhoods of Boston, and I am happy to count myself among their many regular volunteers. To learn more about their work and how you can get in on the fun in their kitchen, click here.